• Wainwright weighs in on Caruso St John's Stirling Prize: "The UK's most prestigious architecture prize has been won by the subtle masters of gallery design. In craftsmanship alone, Newport Street gallery is streets ahead of this year's other contenders." • A who's who of the profession reacts to Caruso St John's Stirling Prize (not all of it laudatory). • Kamin revisits "Trump's sycophantic, vitriolic treatment of architecture critics who've gotten under his prosciutto-thin skin." • de Monchaux sees Trump in Trump Tower: its "darkly mirrored façade is the clearest way to see its namesake." • Bozikovic x 2: he cheers Toronto "thinking big" about its public realm, of which the Rail Deck Park is a "crucial" piece, but will there be conviction/money to go for the big plan? • He looks at the "difficult task of reviving" Toronto's Ontario Place, the 1970s "modernist fantasy land" on the waterfront that "had a purpose that was poetic, but not very practical. It requires 'a big idea,'" too. • The design for the new Statue of Liberty Museum "doesn't intend to detract from Lady Liberty herself" - "we didn't need a much grander building - the grander building is already there." • We get a (brief) look at the three shortlisted designs for a 60-storey hotel that will be "another shake-up" on the Sydney skyline: "There will also be a community engagement program as part of the design process" (what a concept!). • Merrick ponders "what on earth is going on in Montana's Wild West" as he explores "something strange and rather Shakespearean": the Tippet Rise Art Center - a "cultural destination is like no other." • Q&A with Tabassum re: her Aga Khan Award-winning eco-friendly mosque in Dhaka, and what it's like to be a woman architect in Bangladesh. • Saval says it's a "sign of the times" that Brutalism is back" with "an enthusiasm for Brutalist buildings beyond the narrow precincts of architecture criticism - it is a surprising turn of events." • Schwartz revels in the return of the Rose Reading Room, "the storied New York Public Library space. It's a pleasure to have it back" - it is "luxurious in the way that only certain shared spaces can be." 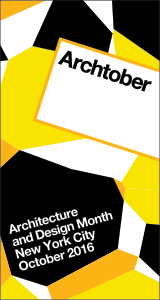 • Last month Jolliffe "highlighted the pressures faced by architectural students"; this time around she finds out what architecture schools "are doing about this and whether it is enough." • One we couldn't resist (especially after Kamin and de Monchaux's takes above): eyefuls of the "Good Walls Make Good Neighbors, Mr. Trump" competition winners (yikes!). • Call for entries: Knight Cities Challenge grants for the best ideas to make 26 Knight communities more successful + 5th Annual A+Awards (with new categories and lower entry fee for students and young architects).